Today, we welcome Jenny Wise, who is sharing her life-lessons and preparations that come with parenting with a disability. All new parents have moments that are stressful, and preparing for the baby is often one of the most anxiety-filled parts of becoming a mom or dad. It’s important to make sure the baby’s room is safe and comfortable, that your home is clean and has all the things you need to care for an infant, and that you are physically and mentally ready to be responsible for another life. There’s a lot of pressure and stress that comes along with it, and when you’re living with a disability, it can be even more difficult to figure out how to get started. Fortunately, there are several simple ways you can start preparing for the arrival of a baby that will give you peace of mind and help you stay sane during those first few nerve-wracking weeks. It’s important to think about the best ways to stay safe and comfortable, and how to make your home more accessible in order to prevent accidents or to allow for a greater range of mobility. It takes a lot of energy to be a parent, and if you have health issues, it can be even harder to find the strength or stamina to keep up with all the new demands. Learn how to boost your energy before the baby arrives by getting into a sleep routine: set a bedtime, stick to it, and make an effort to relax at least an hour before you hit the sheets. This means turning off all screens, listening to calming music, taking a hot shower, or resting with a good book. The goal is to get 7-9 hours of sleep each night in order to keep your body and mind in great shape. Staying hydrated is a big part of keeping your energy up, as is eating well-balanced meals and staying away from refined sugars and lots of carbs that will make you feel sluggish. 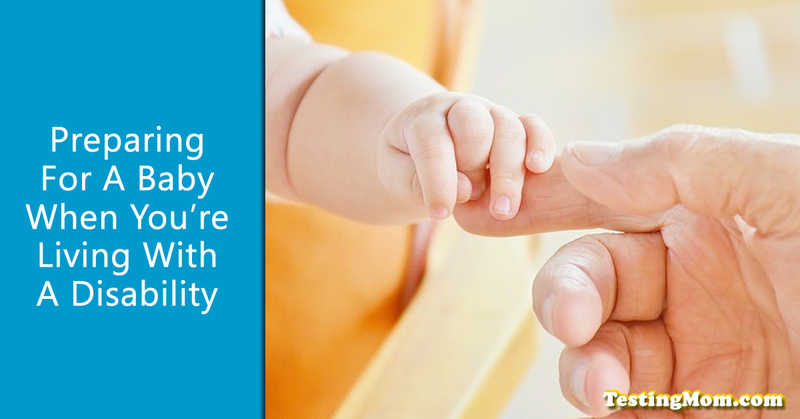 Click here for more information on how to boost your energy levels, even as a new parent. Having the support of your friends and family is imperative at this time; not only can they step in and help when you’re feeling overwhelmed, they can be a great support system when you need to vent or get advice on how to proceed with a particular plan of action. Preparing your house for a new baby is essential when you’re living with a disability, not only to make sure it’s more accessible, but to make sure there are no safety issues. Updating your bathroom with a grab bar and non-slip mat in the shower will help you avoid falls and injury while bathing yourself or your child; adding easy-access handles to drawers and cabinets will allow you to get to the things you need quickly and efficiently. Babyproof your home by installing outlet covers, attaching pieces of furniture to the walls (especially in the baby’s room), and decluttering to ensure there are no trip or choke hazards on the floors. This will keep the baby safe and give you peace of mind at the same time. Babies–newborns, especially–require round-the-clock care, and it can be exhausting and overwhelming if you aren’t prepared. Make life easier for yourself before the baby arrives by investing some time and research into finding items and tools that will help make everyday tasks more simple. For instance, look for a car seat and carrier that snap into a matching stroller, which will make traveling and shopping so much easier, especially if you have mobility issues. Getting your home and life ready for a new baby is a lot of work, but with a good plan and a little help from your loved ones, you can help make everything a little easier when the time comes. Talk to your partner about how to create a safer space, both for you and the baby, and take your time once the baby comes. Rushing to complete a project will only create more stress for everyone. Jenny Wise is a stay-at-home parent to 4 beautiful children. She writes at Special Home Educator.